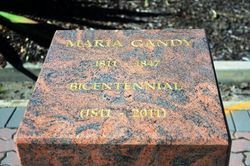 A monument which was unveiled on her 200th birthday, commemorates Maria Gandy. 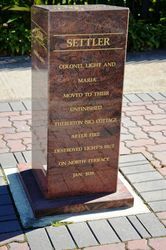 The monument was organised by residents of the street and the Thebarton Historical Society. It recognises Maria in four aspects - mother, carer , settler and pioneer. 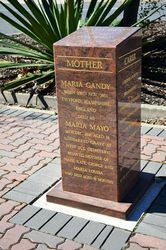 It is fitting that Maria was honoured in 2011 being her bicentennial year as well as the 175th anniversary of the founding of South Australia and the 100th year of International Women’s Day. 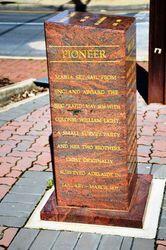 A passenger on The Rapid, one of the first nine ships bound for the new province of South Australia in 1836, she had accompanied her partner Colonel William Light and later nursed him till his death from tuberculosis three years later. 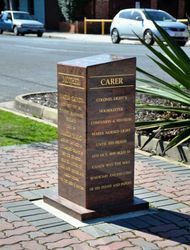 She became the sole executrix and beneficiary of his estate, and the custodian of some of the most significant papers in the history of South Australia which are now in the State Library. Maria had nursed the invalid Light in the brick built cottage which he had called Theberton after Theberton Hall in Suffolk , England where he had been educated in the 1790s. The suburb of Thebarton was named after their home, the variant spelling due to a later typographical mistake. After Light’s death, Maria had married Dr George Mayo and had 4 children. In 1847, when aged only 36, she too finally succumbed to tuberculosis and was buried in an unmarked grave in West Terrace Cemetery. Beloved mother of Mary, Kate, George and Maria Louisa who died aged 10 months. Maria set sail from England aboard the brig "Rapid"May 1836 with Colonel William Light, a small survey party and her two brothers. Light originally surveyed Adelaide in January - March 1837. Colonel Light and Maria moved to their unfinished Theberton (Sic) cottage after fire destroyed Light`s hut on North Terrace Jan. 1839. Gandy was the sole beneficiary and executrix of his estate and paers.